Japan took control of Micronesia from 1914 and under a veil of secrecy developed the region to its liking. Following on with its war with China which began in 1931, Japan initiated a war with the USA in the Pacific and as part of this war, they established major bases in Micronesia, one of them being Truk Lagoon. It became the Imperial Japanese Navy's Fourth Fleet base from November 1939 and the Combined Japanese Navy Fleet were based there from July 1942 to February 1944. Truk Lagoon was regarded by the USA during World War II as the strongest naval base in the Pacific with the exception of Pearl Harbor. Over 37,000 Japanese lived and worked in Truk Lagoon, dominating the 9,000 Chuukese until the end of the war in September 1945. The Imperial Japanese Navy, who were in charge of Truk Lagoon base put their resources into building up their fleet of ships and aircraft, wanting to use them in the final big decisive battle which would settle the war in favour of Japanbut this never came! Beginning with Operation Hailstone, the base was bombed on February 17 and 18, 1944; again on April 30 and May 1, 1944; then with USA B-24 and B-29 bombers, some on a daily basis over many months, then less frequent until the war's end. Further attacks were launched by a British Aircraft Carrier group in June 1945. 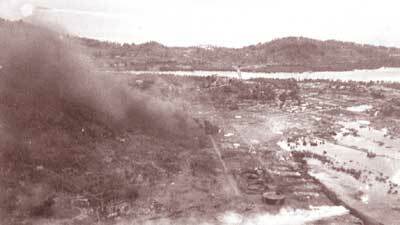 A total of 6,878 tons of bombs were dropped on Truk Lagoon, in one month alone, June 1944, the total was 1,813 tons. No amphibious invasion took place. The result of this was that Truk Lagoon's role as an advance base, then as a base to assist in the defence of the rest of Micronesia and Japan itself, was virtually non existent. Over 4,000 Japanese Navy and Army personnel were killed and wounded. 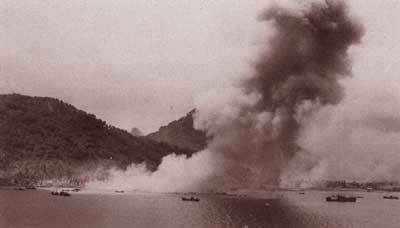 Over 50 ships (mainly merchant vessels) were sunk in the lagoon and about the same number outside of the lagoon; about 400 aircraft were destroyed; and all five airstrips/seaplane bases rendered useless. However, the Japanese Combined Navy Fleet pulled most of its warships out of Truk Lagoon prior to February 1944. Over 120 Chuukese were killed and/or wounded during the war. Most Chuukese had been forced to leave their homes to accommodate over 10,000 Japanese Army personnel. The Japanese military confiscated local food as imported food could not get through the submarine blockade. The continual bombing destroyed local crops and it made it difficult to farm on land as well as collect fish. While Chuukese labourers were once paid, they were now forced into slave labour to construct the many military facilities. Starvation and malnutrition became common, and torture and cannibalism was said to have occurred. Turner and Falgout in their paper Time Traces: Cultural Memory and World War II in Pohnpei, state "Those who experienced the intense suffering during the Japanese military buildup and the American campaign describe it as the greatest hardship they ever endured." It is further summed up by Poyer, Falgout, and Carucci, in their book titled the The Typhoon of War: Micronesian experiences of the Pacific War: "The war forced a rethinking of cultural values, and it expanded islanders' knowledge of global ran military, political, and economic realities. World War II in Micronesia meant, in short, both terrible suffering and momentous change. Nothing would ever be the same again." There are a number of Chuukese who witnessed the war still living in Chuuk and who provide a very real connection with the terrible suffering. There are also many war artefacts and sites on the islands and underwater. In his survey of the World War II features of Chuuk, Colt Denfield concluded that Chuuk "...has insitu as many guns as all of Europe." Many of the Japanese war buildings were torn down and the material re-used to help build Chuukese homes. The shipwrecks and aircraft found underwater are a scuba diver's paradise that not only display the range of munitions and equipment used in war, but the incredible beauty of the underwater world. The term 'paradise' as it relates to Chuuk was put forward by Thoms Gladwin after his six month's stay in Chuuk in 1947. He was part of the USA's teams of sociologists, anthropologists and linguists who were dispersed throughout Micronesia after the war to gather information about the Micronesian people and their customs.